Tattered Angels Part III, a video and another give-away!! I have to say that if I were to choose a company whose products blew me away at CHA it was Tattered Angels. While there, I met Liz Hicks and she was kind enough to take me around their booth. She also demonstrated her mad skillz with Glimmer Mist. I was so impressed that I took their 201 class while at CHA and I loved it! So now comes the fun part! What I liked: I love the mists, really I do. There is a learning curve to it, but once you get it, you will never stop! It is so versatile. You can do almost anything with this stuff. I am in love, sigh... The chips are great as well. What I didn't like: I would like to see more clean and graphic images to work with, but then I think that might go against their name of Tattered... The learning curve of the mists. Trying not to get the splotches on your page takes practice, but nothing you can't over come. Here let me show you how! This tag I misted with Chalkboard Mist in Peacock. I also misted the chip frame at the same time to get the masked look. I then painted over the frame with Glimmer Glam in Mermaid a couple of times to get the color I wanted. 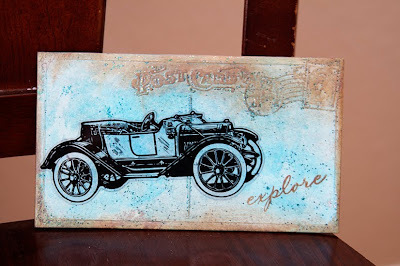 For this chip tile I misted it with Patina Glimmer Mist and then went over it with a light layer of Mermaid Glam. Stamped the explore and adhered the car glass(acrylic) to it. It was just a fun thing to make and enjoy. This door hanger I made with a chip tile as well. I misted it with Glimmer mists Choc. Covered Cherries and Cranberry Zing along with the Chalkboard mist Peacock. I then inked it with StazOn. I went over the Dragon Flies with Glimmer Glam in Luscious Lavender to make the wings pop. I love the bigger pieces of glitter that come in the Glam. So FAB! This tote was fun. I just punched out 2" circles with a punch and placed them on the tote with glue dots and spritzed over them. 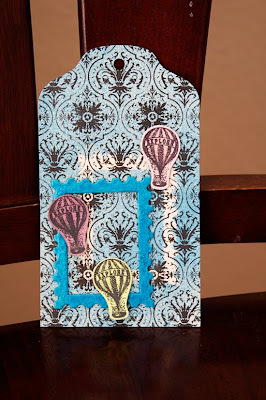 I then Stamped over a few circles with one of the stamps from the Time Traveler set. Punched a hole with my Crop A Dile for the brad on the flower to go through. So I have misted everything in sight it seems! I am pretty much a fan of Tattered Angels. Once I learned how to properly use the mists, I was golden! Products: Tattered Angels chips, glass, mists, glam, etc. What do you think? Are you in love like me or are you just not mist-able? Leave a comment by midnight EST on Saturday to be entered to win a prize from Tattered Angels! As you could guess, Your blog is on my google reader and I always enjoy learning about new products from you lovely ladies. I saw the youtube vids posted about all the demos at CHA and loved it immediately. So pretty. I love reading your reviews. It really helps to know if the new products out there are worth it. Thanks for all that you ladies do! The mist definitely look like they would be fun to use. I would love to try them. Thanks for a chance to win. Great review! I am spraying everything in sight to see what effect it has, so I am still experimenting. Trying to learn how the colors mix with each other. Fun, fun , fun!! I enjoyed reading the review & seeing your projects..I have a couple of mists but definately need to try more! I really need to try these. Hope to win! Thanks for the chance! AMAZING samples Ashley!!! You've definitely got me wanting to try out these mists!! I don't own any, could you suggest a few of your favorite colors? thanks!! Great reviews. You are enabling me to try the mist. It seems to be fun to use. I would love to try them. I love their mists. I've never seen or used glimmer glam, however. Thank you so much for your tutorial!! I've been a mist user, but I had no idea that the splotches were because I was shaking my bottle. That swirl tip is priceless! This mist looks so fun to use! Great video!! Thanks for the chance to win!! I'm in love! Would love to win! Please pick me :-) !! Love your review...When I first got some of the mists, nothing was spared. However, my husband was a little irritated when I sprayed the dog...I just wanted to see what the fur would like with some glimmer! I'm truly addicted to anything Tattered Angels and if it can be glimmered.... I'm spraying my little heart out! I love "clean" lines too, but I would love to try some Tattered Angels!! Love your reviews and I love TA! Thanks for the chance to win! I love all the Tattered Angels products~! Great video Ashley!!! It was worth staying up until 2am for! There's definitely a learning curve for using the mists! You know, I absolutely adore glimmer mists but I haven't tried the chalkboard mists. I think I need to get some to try. Great reviews as always!!!! Wow! This glimmer mist looks awesome! I am trying to develop my less symmetrical skills and it looks like Tattered Angels is the perfect place to start. Gorgeous but not so crisp and tidy. I need more of that. I love the textures and am dying to see the mists IRL. The pics are beautiful, but when I see the word 'glimmer' I know a picture is not going to be worth those thousand words. BTW, double points if you use scrap papers to catch your overspray to make glam scraps. i love glimmer mist and tattered angels but unfortunately no one around me sells it! So i have limited colors of mist! :( I wish my local scrapbook stores would get on the ball and get some of these products in stock!!! Fab tip about swirling rather then shaking the bottle, I'm going to give that a go. I have a few of the mists & love them but now I want to try the Chalkboard mist! Great review! I love Glimmer Mists! Thanks for the review! I only have gold so far but the effect is awesome. I love to win more! I love Glimmer Mist! I'm really looking forward to trying the Chalkboard Mist and the Glimmer Glam. I am totally in love with Glimmer Mists; in fact I love almost all the Tattered Angels products. They make my projects look 10x better than they would without them! I like Glimmer Mist. I used it just last night to mist some of my ribbon! Thanks for the tutorial. Great video! I really love the bag you made. IF it gets wet does it fade? I LOVE glimmer mist too, but agree that I would love more graphic images. Loved the week of Glimmer Mist! I love glimmer mist and the glam looks really fun. I have never used Mists before. Never even had the urge until now! LOVE the tote. So cute. May have to steal that idea for teacher appreciation gifts. Thanks for the great reviews. I love your reviews. I love it even more when more than one person reviews a product. Different insights and ideas are very helpful!! i am absolutely in LOVE with the Glam! i must have some! and i'm totally curious about the Chalkboard mists and the tiles - so versatile! fabulous samples esp the bag! love it!! i've used their mists before and i totally loved it! although their chipboards are on the expensive side, it's all worth it! would be so thrilled win this giveaway! I am just so mist-able---love it! fab projects. I have one bottle but would love more color. Misting is so much fun! Great review! I love Tattered Angels! Great video. Your projects are awesome. I have to say that I'm in love with Glimmer mist!! I love everything that you can do with it!! The possibility are endless!! I am totally in love with misting. It is so versatile and can change the way a project looks or alter older paper for a fresh look. What a great video. So many helpful tips. I hadn't heard of the glam or chalkboard ones, they look like alot of fun. I love your door hanger the most. It is gorgeous. Loved your review and video. I have not tried these products yet because I was on the fence about them but now I think I'll have to give them a go! I love the look but have never tried it!!! Would love to give Glimmer Mist a try!!! Great tutorial. I love Glimmer Mist. I wish I could bathe in it! Learning and loving this product!!! I need to try them. I never see them in the stores in my area, but of couse online is a option. Its great to get to see them in action! I was unmistable but the more I see the more I'd like to try it. The mists look like so much fun! Thanks for the video with all the good tips! I am totally in love. Every time I go to my LSS I find another color "I HAVE TO HAVE!" Thanks for the video! I'd love the chance to try these mists out! I love all the colours available in the Glimmer mist. 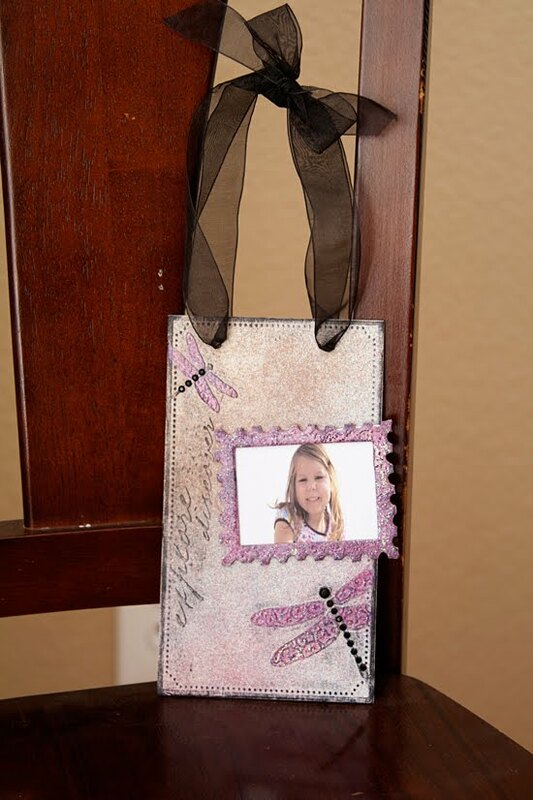 It makes it so easy to custom match embellishments. Excellent demo. I have to agree that there is a big of a learning curve with this product line. You are a lucky girl getting to play with all these really cool goodies! I got to play a ittle at CHA ad am anxiously waiting for glam and chalk paint too! Looks like fun! I'd love to try them. i love the mists, i just don't use them enough. thanks for more ideas! Thank you for the tip on how to use them without splotching. Now I will be more confident when I try them again. After reading about it all week, I think I am definitely ready to give it a try. It looks like fun! 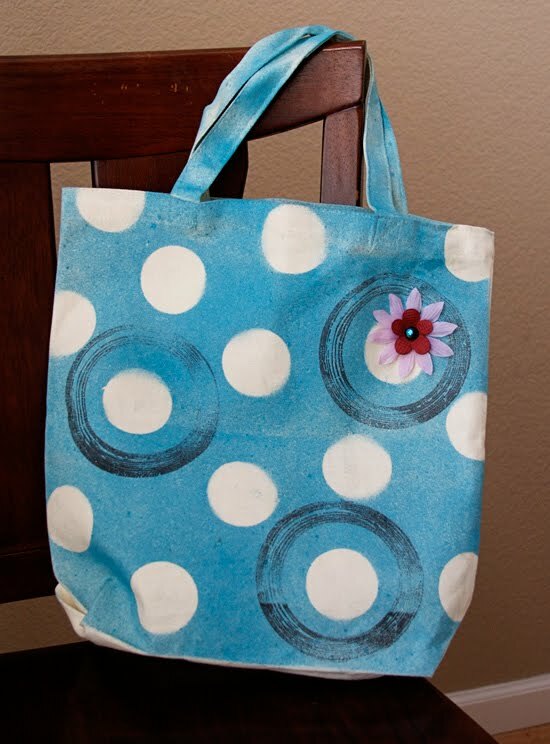 love how you misted the canvas bag--so cool! I loved learning about the mists and products by Tattered Angel. I was frustrated with the spotchy drops on my projects but LOVE that you've solved that dilemma for me....now off to mist....hee hee! Would love to try Gimmer Mist! I haven't seen it in person yet. Can't wait to play. Love the Glimmer Mists! Love how you went wild and misted everything! Thanks for the chance to win some! Thank you for the tips! I will start swirling and I have to get some of the glam! Thanks for the informational video on the glimmer mist items. It was very informative. Maybe I am ready to try it myself. God bless! Wow! Gorgeous creations! I have about 20 bottles of Glimmer Mist but have too not used them very much because of the "splotches". Thank you so much for the video tutorial! I'm going to try them again using the swirling technique and spraying away and towards your project! And, I definitely need some Chalk Mist and Glimmer Glam now! I absolutely LOVE Glimmer Mists and have several colors. I hadn't heard of the other two products you featured before but will definitely be looking for them next time I purchase scrappy supplies! Thanks SOOOOOOO much for the swirly technique! I will love GMs even MORE now! Off to play!!! Thank yo for letting us all know about swirling the mist instead of shaking it. Now my projects will look better without the splotches! Oh! I love it! Love the swirl tip!!! I LOVE to use Glimer mist and I cant wait to use Glimmer glam and Glimmer glaze. I'd love to try some more mist. I only have brown right now. I just bought my first glimmer mists and I am so happy that I watched the video!!! Now I can't wait to try them!!!!! I have really been wanting to get my hands on these mists. I have some of the Smooch sprays by Clearsnap and I wasn't too happy with them. I might try some of these tips with them, but I don't think I'll get quite the same results because it looks to me (and I could be wrong) but it looks like the Tattered Angels mists have a longer spray in each spray than the Clearsnap ones, they seem to be more of a short splotchy spray. But I will definitely try swirling instead of shaking to see if that helps with them, too. And best yet would be to get my hands on some of those mists, they look like a ton of fun. I wish my LSS would pick them up instead! Thanks so much for all your reviews. It helps me decide if I want to try the product plus gives me ideas of how to use the products. Love that tote bag! I still need to get comfortable with misting ... hard to do when I only use it at crops because I don't have my own. I love my mists, but can't wait to try the glimmer glam. Wow, what a great all around product line! Just a note, we are always told to store products that need mixing on their side so the metallic, glimmer, etc. isn't as clumped together. I do this with my mists and have never had a problem. And don't forget to stir, swirl, and shake everything that can clump together, at least once a month. I am so in love with Glimmer mist! I started out slow, but once you get a few colors in your hand and start to play, I think you realize there is sooooo much potential and you can really have a LOT of fun with Glimmer Mist! I cannot get enough of these amazing colors! I love ALL things Tattered Angels but have not seen the Glitter Glam nor the Chalkboard line yet. Can you help me out with that? I only have 2 colours of glimmer mist so far but I am definitely enjoying them and would love to try more Tattered Angels products. Awesome projects!! 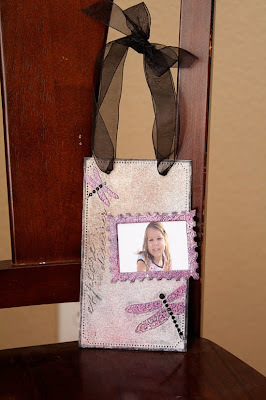 I just love Tattered Angels products!!! I love them...just need to practice more! The look they add to any page or project is amazing! Thanks for sharing your technique for misting! Glimmer Mist is so versatile! I am always yearning to add to my stash - I don't have a rainbow of colours yet! Thanks for all the reviews and tips/techniques. This really has helped me decide to try the mist or not. Hope to get some soon! I love glimmer mist! I can;t wait to try the new chalkboard and glam!!! I've only used it a couple of times, but wasn't really impressed. Maybe I just need more practice....if I win, I can get more practice, right? Or maybe I could schedule a private class with Heidi! OH i see the endless possibilities of Tattered Angels Glimmer Mist- i just love it. I am in love...just not quite sure how to use it..until now! Love reading the posts!!! Those projects are wonderful - especially like the video on how to use the mists! 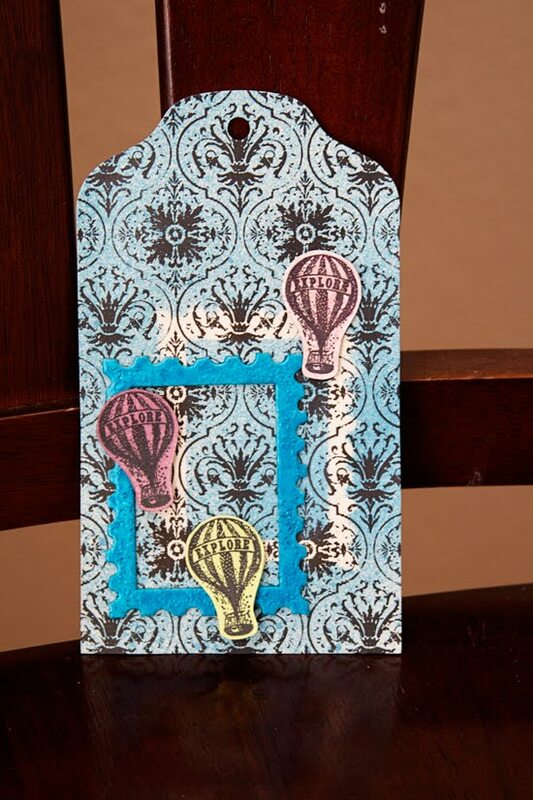 I have watched other scrapbookers use the mists and wondered if they were easy or not to use - your tips make it sound easy - I think it's time for me to give them a try! Thanks!! I love Glimmer Mists - I have just started using them but they are so fun and versatile! I really enjot you ladies honest reviews!! I love that you aren't really sponsored so it's an accurate review, and as you said you really have to learn to love some products! I am all about MISTS! I love them and I love how you showed how they can be used in so many different ways! I would LOVE an opportunity to play with any of the Mists! love your projects and video! GM is a great product and is so usable. I think I am hooked and find that it is my go to item right now. I love the fact that you can even use it to paint on wood, although I have only tried it on MDF.... Keep up the great reviews!